Moon Predictions Ltd. Offers over 35 years of experience at offering a professional service in assisting people in matters of relationships, career, family and future happiness. We have a team of top Clairvoyants, Mediums and Psychic readers who are available 24 hours a day and will amaze you with their psychic ability. Our readers are carefully selected and hand chosen from all over the country. We only employ the very best. The word Clairvoyant means ‘Clearvision’! A Clairvoyant channels their ability from the reading and see’s situations relating to past, present and future. The word medium means ‘Channel’! Someone who can either see, hear or feel the future and make predictions. 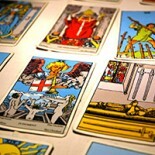 Years ago known as Fortune Telling now usually referred to as a Tarot or Psychic reading. The Fortune Teller is now known as a Reader, Clairvoyant, Medium or Psychic. Click here to find out more about what psychics do.